In the world of the Kindred, vampires lurk behind every shadow, planning their machinations and watching their prey. But who watches the watchers? Powerful Kindred from all sects (and none) move among their peers, protecting the Masquerade, interpreting the traditions of Caine, leading the Sabbat against the Antediluvians or subtly pulling strings in the darkness. Who are the most feared and most powerful vampires in the World of Darkness? 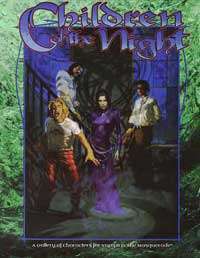 Children of the Night fully details the heavy-hitters of Vampire's World of Darkness. Included are the justicars and many archons of the Camarilla, as well as key princes,bishops, pack priests, Sabbat cardinals and prisci and an inscrutable Inconnu or two - all the undead to know... and fear. This title was added to our catalog on January 01, 2001.